Properties in Salles average 4.6 out of 5 stars. Property 6: The Logis du Val, comfort and calm family. 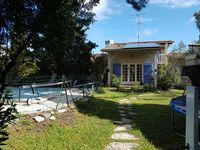 Property 20: Bay of Arcachon "La Douiria" quiet studio. Property 35: At the heart of the Bassin d'Arcachon bordering salt meadows, the coastal path. BEAUTIFUL MOBILE HOME New camping 4* 200m from the beaches of Lake OCEAN & POOL - Mobile home 3 sunny rooms in the moors in Sanguinet. Property 46: BEAUTIFUL MOBILE HOME New camping 4* 200m from the beaches of Lake OCEAN & POOL - Mobile home 3 sunny rooms in the moors in Sanguinet. Property 50: BEAUTIFUL MOBILE HOME New camping 4* 200m from the beaches of Lake OCEAN & POOL - Mobil home 2 rooms very equipped in the moors to sanguinet.